And so Barcelona's dominance over their arch rivals continues. With Real Madrid faltering in the La Liga title race, a win in tonight's El Clasico was vital to keep their fading hopes alive. The two rivals have become even more familiar with each other in recent times, with their Copa Del Rey meeting in midweek still very fresh in our minds. Barcelona embarrassed Los Blancos in their own stadium in that one, when Luis Suarez led his side to a convincing 3-0 victory. The home side would certainly have been hoping to right a few of their recent wrongs this evening, but it would be the visitors who would take the lead. It was Sergi Roberto who supplied the killer pass, with Ivan Rakitic getting in behind the Madrid defence and dinking the ball over the onrushing Thibaut Courtois. Tensions were running high in the game, with ultimate shithouser Sergio Ramos up to his usual tricks. He laid an elbow on Lionel Messi's jaw, something that was not well received by the Argentine. Barcelona missed a couple of gilt-edged opportunities in the second half, with Ousmane Dembele flashing a chance beyond the far post when he perhaps should have done better. 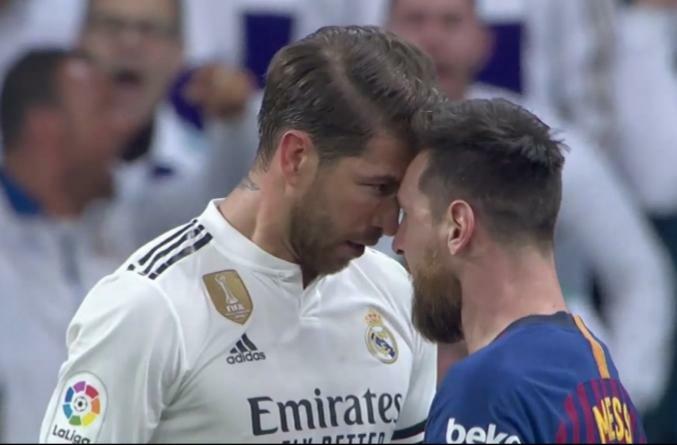 Sergio Ramos continued to act like Sergio Ramos throughout the contest, and did his best to knock Messi off his game. It worked to some extent, but Messi still put in a very tidy performance. There was till time for him to throw one more elbow, with Arturo Vidal the target on this occasion. Real Madrid would have the majority of the ball in the closing stages, but failed to convert it into any real chances. Vinicius Junior looked dangerous throughout, and was their best player once again on the night. He certainly looks like an incredible talent, and could be one of the top players in the game in the not too distant future. That will be little consolation for Madrid tonight, however, as they fell 12 points behind their rivals in the La Liga table.